One of the favorite crops of Industry 4.0 is exoskeleton products. These exoskeleton products are based on human physiology and provide support to the human body in the necessary areas. The Chairless Chair is the perfect solution for people who have to work for long periods of time or who are uncomfortable with their working position.At the same time, the chairless chair is a mobile product, but briefly most important feature is that it does not constitute an obstacle when walking. So you can sit anywhere with this product and change your position at any time. Provides a comfortable sitting position, makes decrease back pain and back problems, providing comfortable work power, motivation and high productivity. 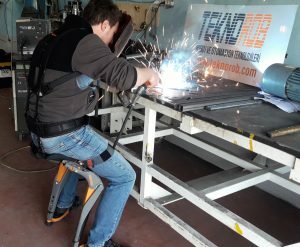 Teknorob Robot ve Automation Technologies introduced us to exoskeleton technology with bring an ergonomic innovation technology by becoming distributor of Chairless Chair. Teknorob Robot ve Automation Technologies, firstly making process analysis than recommend integration of Chairless Chair and with recommendation we optimize it according to process conditions to targeted companies with Teknorob’s first pilot activities in Turkey. After analysis and integration Teknorob gives a certificate with their special training to last user. Chairless Chair can be used many process and many area. If you would like to increase productivity with quality, Chairless Chair makes it real. Since March 2009 we have become your working partner by reducing your workload. Until today, you can produce solutions for dozens of factory automation and robot systems.